Baptist woman received calling from God after reflecting over simple backyard chore. Tyson provides an easy-to-read reference for believers who are serious about gaining eternal life. The adage “One thing leads to another” holds true for Zadia Brown Tyson, a devout Baptist church worker in the Sunshine State. While removing weeds in her backyard in preparation for a family reunion, she could not help but notice the grass and the weeds continue to grow together. Then one day, she received a message or revelation from God on the impact of sin in the life of a Christian. As she continued to pull the weeds in her yard, God spoke to her again, this time handing her a mission. The book “From Salvation to Sanctification; Then Eternal Life” is her response to the religious calling God gave to her. To exhort fellow believers to shun sin and accept Christ in their life is a mission she takes seriously. Her books aims to introduce believers the basic teachings on God, Jesus Christ, the Holy Spirit, sin and salvation, sanctification, and eternal life. Through the use of Scripture, Tyson delivers her catechism in simple language, thus making her book a wonderful resource for youth Sunday class, though she teaches Sunday class for adults. Tyson summarizes the faith for lay believers who want a reader-friendly introduction to eternal life. 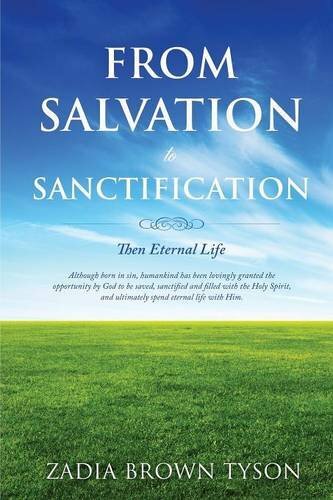 “From Salvation to Sanctification; Then Eternal Life” recently appeared in the 2017 London Book Fair New Title Showcase, held last March 14, 2017. Zadia B. Tyson is a wife, mother, grandmother, sister, aunt, cousin and friend, but most of all, a child of God. She is a member of Mount Calvary Baptist Church in Pompano Beach, FL where she serves as: Director of Christian Education and Children’s Church, Teacher of the Median Adult Sunday School Class, Secretary for the Church Growth Ministry, and a member of the Missionary Society and Women’s Ministry.